American photographer Michael Eastman’s large-scale photographs examine our man-made environments on an international scale. 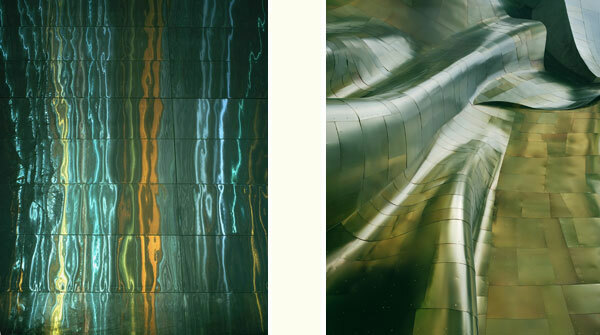 Made in locations across Asia and North America over the last four years, interior and exterior spaces filled with reflective or undulating surfaces, dramatic lighting, and the distinctly unpopulated locales encapsulate the commonality of modern and contemporary architecture of some of our major cities: New York, St. Louis, Toronto, Osaka, and Shanghai. Eastman’s images are made after dark, requiring lengthy exposures. Pre-visualizing the image is impossible so the first time he sees the image is after it is processed and scanned into the computer. “It is a very compelling moment, as the previously unseen subtle traces of light and faint reflections emerge as stunningly bold field of color and unexpected compositions,” says Eastman. Michael Eastman was born in St. Louis, Missouri in 1947. The range of his oeuvre is diverse, including such themes as horses, sublime landscapes and urban and European architecture. His publications include his most recent Havana, Vanishing America (Rizzoli, 2008), and Horses (Knopf, 2003). His photographs are featured in Rainer Maria Rilke’s book Auguste Rodin, published by Archipelago Press. Eastman has been a recipient of the National Endowment for the Arts grant and has been published in Time, Life, and The New York Times. His photographs are included in numerous public and private collections including The Metropolitan Museum of Art; Museum of Fine Arts, Boston; The Art Institute of Chicago; Los Angeles County Museum; and the San Francisco Museum of Modern Art, among others.